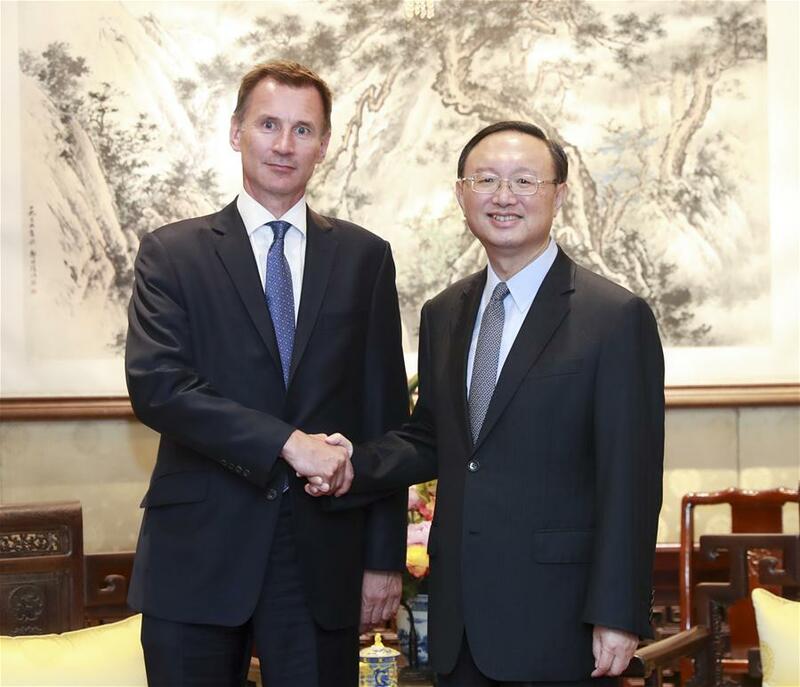 BEIJING - Yang Jiechi, a member of the Political Bureau of the Communist Party of China (CPC) Central Committee, met with British Foreign Secretary Jeremy Hunt in Beijing on Monday. Yang, also director of the Office of the Foreign Affairs Commission of the CPC Central Committee, called on the two sides to implement the consensus reached by their leaders, strengthen strategic communication, enhance political trust, and expand cooperation. Yang also called for joint efforts to promote economic globalization featuring openness, inclusiveness, universal benefits, balance, and win-win results to inject more impetus into China-UK ties. Hunt said the UK is willing to work with China to boost the development of the "Golden Era" of bilateral relations and safeguard multilateralism and international order.